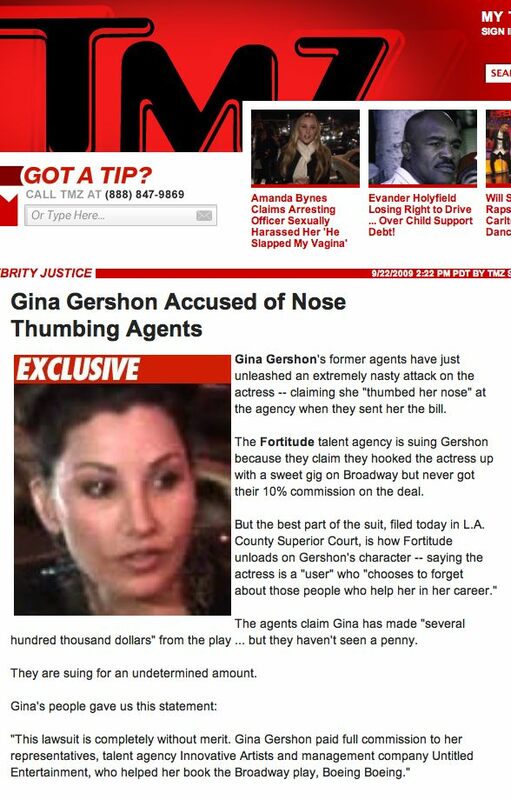 Gina Gershon's former agents have just unleashed an extremely nasty attack on the actress -- claiming she "thumbed her nose" at the agency when they sent her the bill. The Fortitude talent agency is suing Gershon because they claim they hooked the actress up with a sweet gig on Broadway but never got their 10% commission on the deal. But the best part of the suit, filed today in L.A. County Superior Court, is how Fortitude unloads on Gershon's character -- saying the actress is a "user" who "chooses to forget about those people who help her in her career." The agents claim Gina has made "several hundred thousand dollars" from the play ... but they haven't seen a penny. They are suing for an undetermined amount.